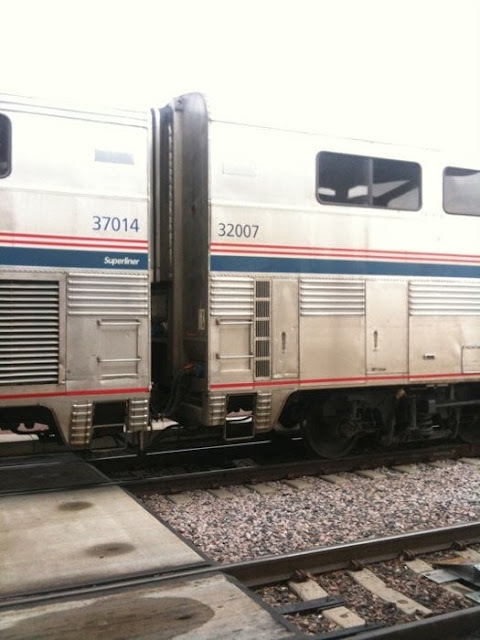 As I climbed aboard the Amtrak Texas Eagle --Fort Worth to Austin--I was thrown back into the past~ to a time of innocence, elegance, and kindness. 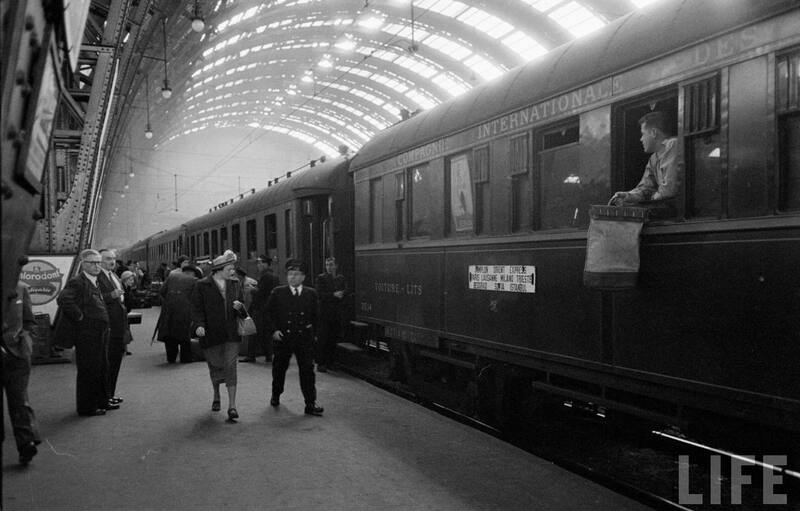 Visions of my first ride aboard a train cascaded forth and pulled me down memory lane. It was the mid 50's of the last century, when as a young child, I boarded the train in Louisiana with my Aunt Mattie Maude. A deja vu moment--we were headed to Fort Worth and a visit with my great Aunt Lora. I distinctly remember having on my Sunday best dress and white cotton gloves. My Aunt had on her fur coat and a hat. It is remarkable the things that made a lasting impression about that trip. I remember little about the trip except we were on the train at night and it was cold. Why one who cares so little about clothes would remember what we wore is beyond me, but that is the most vivid memory. That and the kindness of the conductor and the gentleness of the time. Fall forward 60 years and I am in Europe last summer riding the Euro Rail from country to country. What an amazing adventure. You can set your watch by the rail system in Europe. For the most part, we traveled between five countries without a hitch--well except for human error on our part--and the experience was one of the highlights of our trip. It seemed like a great idea to take the Amtrak to Austin. The interstate between Fort Worth and Austin is under construction. My last trip driving there included a hour and half delay in the construction zone and some of the worst traffic imaginable. My DIL suggested I look into the train and surprise the cost is only a little more than the gasoline would cost if I drove. While reading the reviews, I noticed quite a few negative comments, but decided even if I was delayed a little, it would be wonderful to not have the hassle of the drive. From the moment the conductor gave the "All Aboard", it went like clockwork--we pulled out of the station right on time. One hundred feet down the track we stopped. After a bit the engineer announced he was waiting for the computer to tell him the route and it was OK to leave. Seriously--the track only goes one way--this train makes this route everyday-but we have to wait for the dispatcher to send the "Go Ahead" via computer. Knowing my love/hate feelings for computers and all the technology that goes with them--this should have been a warning! The first half of the trip is delightful. We are passing through towns, ranches with long horns grazing and verdant grass blowing, and fields filled with knee high corn. As we clickty-clack along we pass from flat terrain where you can see forever to sheer rock cliffs and overflowing rivers. Texas at its best is rolling by outside the window. Soon the car grows quiet and I notice many of the passengers have been lulled to sleep by the gentle swaying of the car and muffled sound of the train singing the decades old lullaby of the railroad. We begin to make our stops along the way to a final destination of San Marcos deep in the south-western part of Texas. About mid way to Austin, I am joined by an army helicopter pilot on his way for a four day leave. We only have a short time to get acquainted before the train suddenly stops--dead still silent on the tracks. At first I think we are waiting for a freight train to pass, but the engineer soon announces the engine has stopped, the computer has gone down and we are sitting at a dead stop with no power. THANK GOODNESS I was not on an airplane! Who knew these iron monsters could just quit. I will not give you the full story of the three hours we sat waiting for some kind of action, but instead only hit the high points. There is no air conditioning nor can you flush the toilet without power. The cafe car cannot sell you snacks or drinks because the computers are down. They will not let you off the train, for you see we are in the middle of Farmer Brown's corn field and there is a steep decline to get off. When people are hot, hungry, and frustrated, they are not at their best. The engineer finally announces a freight engine is coming to push us to the next town with a siding where we will be met by motor coaches to take us the rest of the way. The phone calls and discussions all around me are absolutely amazing--these people are NOT happy campers! The army pilot is going to jump off the train and meet a uber car to take him to his destination--at the cost of $165. His bank account has to be grateful this did not happen since they would NOT let him off the train. Finally we slowly make our way to Little River, Texas. It is so small I could not find it on the map. This appears to be a big deal for the quiet Texas town since the residents are at the siding making pictures of the transfer. At long last we are loaded on buses--one car at a time--and sent to our destinations. The Amtrak official apologizes over and over--those with a good sense of humor are laughing and those with not such a good sense of humor are threatening law suits. I arrive in Austin four hours after my expected arrival time, but the good news is I arrive! NOW--let me tell you the good thing about all of this---it gives me LOTS of blogging fodder. I am still rolling around all that was said--and all that happened. AND--Amtrak had the opportunity to redeem itself when I returned to Fort Worth 36 hours later. It was a shaky beginning since the train was delayed 45 minutes, but once we got started it all went well. The other great thing---it rained all the way home--I did not have to negotiate the treacherous interstate driving 75 miles per hour in the rain. It reminds me of life---we have expectations of how things are going to play out--and BAM--the computer goes down and the engine stops in the form of some unforeseen and not anticipated occurrence. We have two choices---get mad--rant and rave---threaten the man in charge or treat it as a teaching moment , roll with the punches--keep our eye on the destination and make the best of the circumstance. Do we proclaim God's sovereignty in every step of our trip or do we bemoan our loss of power and refuse to leave the siding? Our response--our reaction is totally in our hands. Though I remember little of my first train ride, something tells me I will remember in detail this excursion. AND---YES--I will ride the train again! You and Marilyn should take a Texas Eagle trip, Ronnie! There is no better way to see Texas! Loved reading this as it brought back memories of my many childhood rides on trains from the largest train station in the south at Texarkana. That huge station is boarded up now with only a small gate on the side where the Amtrack office is located. My train memories include eating in the dinning car being served by men in crisp white jackets, riding in the caboose, watching the turn table in the station turn the huge engines around to go back from the way it came. The clackity clack of the train wheels on the track would sometimes put me to sleep..Since my grandfather worked at the station, we had free reign of the train cars we rode. Each year we went from Texarkana to Ashdown, AR and then back again. Thanks for reminding me of those wonderful times that I surely took for granted back then. What an amazing childhood--to be treated to an annual train ride AND have free reign of the cars! Growing up in Farmerville, the only trains we saw were freight trains. It took a trip to Monroe or Shreveport to get on a passenger car. Those were golden years--life was harder--but much simpler too! I am delighted I took you down Memory Land, Jerri! This brought back memories of my many busines stravles by train instead of car because I could work on my laptop whilst travelling. I had many delays and transfers to buses when trains broke down. The worst was in winter, it was snowing heavily, the tracks froze and the train stopped with no lights, no heating, no toilets for three hours. Often we were told there would be no trains due to staff shortage. I couldn't see why they could not hire taller people. Also train delays in departures and arrivals. I wrote to the train company suggesting they would be more accurate if they replaced their timetables with calendars. They have still not responded. My laugh for the day, Victor! Here I was bragging on the European Rail system!